This review is about item#9209085. I always use a ballpoint made by another company, but I wanted to use it once, so I purchased it, so far there is no problem. This review is about item#09209085. Speaking of the hexagonal wrench, it is a worldwide manufacturer that can say it is PB or BONDUS, but the goods that arrived at my place also waved 1.5 mm wrench bent and ... on the long side was wavy . Well, it does not apply a strong torque to the set screws of M3, so it will be OK for the time being, but I will not buy it if it says "I will buy it next time". It is not recommended for people who work with the small nominal diameter screws as the main. It is wonderful in terms of accuracy that it can be said as Bondas. I will definitely make a fit with less play than PB. It is truly an OEM original of snap on. However, there was a terrible thing, the items delivered to me were 1.5 mm and 2 mm bent. Because there was a review that there were several bends in review of Bondas's other items, I thought that product management concerning Bondas' bend was such a thing, I stopped asking for returns, I also felt that curved items would arrive. Hexagon accuracy is wonderful, so I recommend it to those who do not use small diameters. However, I do not recommend it for those who are planning to use 1.5 mm, 2 mm, 2.5 mm. Nothing is unpleasant as you use the long sides of a crooked hexagon ball point. This review is about item#45537746. I feel shaky in the hexagon socket and I feel less backlash than other manufacturer's wrench. I thought that the wrench was too long when it arrived, but it is easy to grasp and no problem. It is convenient to use even in a narrow place and it is useful. I understood using Bondas until about 20 years ago to be a very excellent maker. I think that this product is very excellent in terms of cost performance even though we think about ease of use and wear. I feel that it is good to be conspicuous even if the silver body falls into cutting oil or chips. In the past we used some wrench, but about 2 years was the limit on continued use. I feel that the surface of the wrench I purchased this time is firm and firm. I like the color of the plating calmly. It is a pleasant gem after three years. 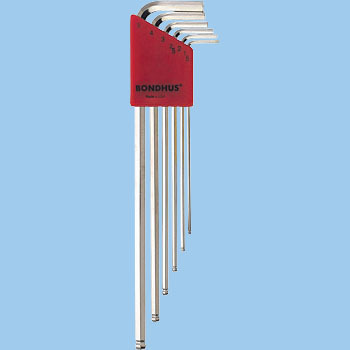 It is Bondas of Hexagon wrench's famous book, but its usability and cost performance are also the best. I used it for several years with one of the most frequently used tools, but it can be used without plating peeling with less wear. I also like bright surface treatment that makes it easy to find many things that drop into dirty places. I fit in various bolts perfectly abnormally. I think that it sounds strange, I think that plating is thick or something. There was not something that never ended, but the feeling of tightening is the best by the rash.